This time I want to elaborate on the so-called „makezu no tsuba“ (まけずの鍔), lit. 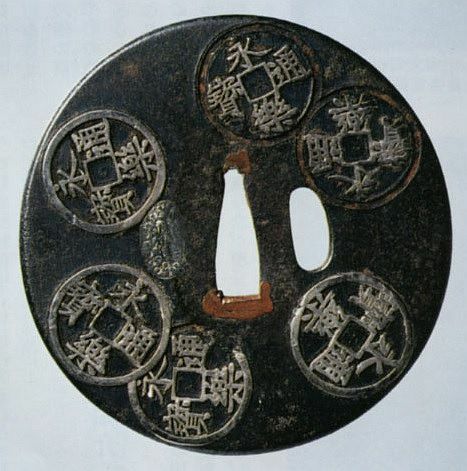 the „invincibility tsuba“ (picture 1). First of all on the piece itself. It is a plain iron tsuba in maru-gata which shows all over so-called „Eiraku-Tsûhô“ coins (永楽通寳, picture 2) inlayed in silver, namely six on the omote and seven on the ura side. The entire interpretation and workmanship speaks for a straightforward Shôami attribution and is not that exciting at all. The jûyô-bunkazai designation – it became even kokuhô at first instance in 1920 – goes solely back to its provenance. It was namely worn by the great warlord Oda Nobunaga (織田信長, 1534-1582) himself and later offered by his descendant Oda Noto no Kami Nobukado (織田能登守信門, 1662-1716) to the Sôken-ji (摠見寺). Nobunaga himself once donated the Sôken-ji to Azuchi Castle (安土城) in the Tenshô era (天正, 1573-1592). Picture 2: Eiraku-Tsûhô copper coin. Regarding the motif, the case is as follows: In the fifth month of Eiroku three (永禄, 1560), Nobunaga was about meeting Imagawa Yoshimoto (今川義元, 1536-1560) and his huge army of about 40.000 men (the transmissions range between 25.000 and 45.000 men) at the upcoming Battle of Okehazama (桶狭間の戦い). He was only able to gather about 2.500 men and went thus to the close Atsuta-jingû (熱田神宮) to pray for victory. He asked the gods for giving him a sign if his prayer is answered, grasping a handfull of Eiraku-Tsûhô coins and tossing them into the air. When they came down, every single one was showing heads. Thus he told his men that their victory is assured and really, Nobunaga was able to win and become one of the most influental warlods of his time. So he used from that time onwards the Eiraku-Tsuhô coins as motif of one his banners (picture 3) and had them inlayed on the tsuba of the sword he was wearing during the battle. There exists also a slightly different transmission on this incident. It says that Nobunaga addressed his men after praying at the Atsuta-jingû by saying the gods are with us when the coin will show head. He tossed it (this time only one coin) into the air and showed head. After the victory, the Oda retainer Hayashi Hidesada (林秀貞, ?-1580) confirmed that truly the gods have spoken through the coin. But Nobunaga replied with the Zen proverb „ware tada taru o shiru“ (吾唯知足) and showed Hayashi the coin which had heads on both sides. The proverb means „I only know what is enough“ or „I only know that I´m okay with what I got.“ But it is assumed that this version of the coin-toss transmission of Nobunaga goes back to a merging with the coins showing these characters, i.e. „ware tada taru o shiru“. 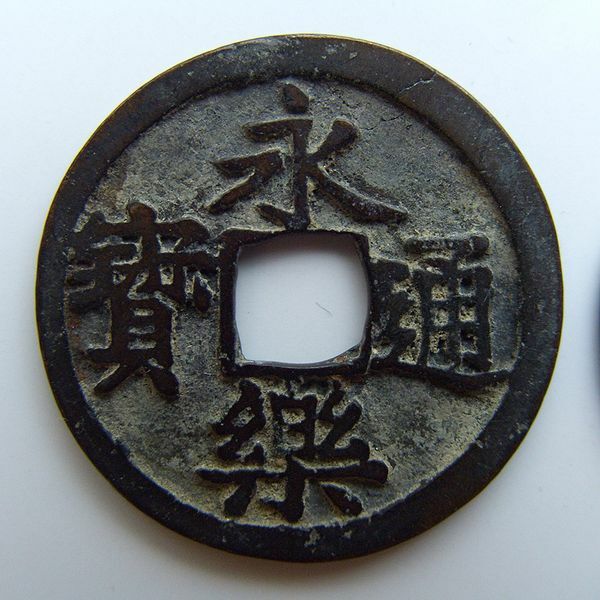 These coins (picture 4) have a square hole in the middle which represents the radical (口). The four characters of the proverb all bear this radical and the parts (五), (隹), (止) and (矢) and are arranged around the central square to become (吾), (唯), (知) and (足). Incidentally, this coin too was used as family crest by several warriors. Picture 3: The Eiraku-Tsûhô banner (Eiraku-sen no hatajirushi, 永楽銭の旗印). Picture 4: The ware tada taru o shiru coin. So after Okehazama, Nobunaga was able to win several successive battles and thus he called the tsuba the „invincibility tsuba“. Regarding the motif of the tsuba in question and his banner, there is also another approach about its meaning. 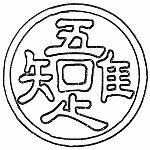 The Eiraku-Tsûhô copper coins were minted in China by the third Ming emperor Yônglè (永楽帝, jap. „Eiraku“) but imported on a large scale during the Muromachi period. They were in circulation all over the country until their use was officially stopped by the bakufu in Keichô 13 (慶長, 1608). That means some speculate that Nobunaga tried to express via his Eiraku-Tsûhô coin banner that his power will spread all over Japan just like the coins. Others in turn see the use of the coin as symbol in connection with his economic policy. To stimulate business, Nobunaga introduced namely a free market system called „rakuichi-rakuza“ (楽市楽座) which abolished and prohibited monopolies and opened guilds (za, 座) and removed other barriers and taxes. This rakuichi-rakuza policy meant an important boost for the Momoyama-era economy and was the first step for a nationwide economy, although later again strictly regulated by the bakufu. So probably all these factors played a role when in 1920 a quite mediocre Shôami-tsuba was designated as kokuhô. By the way, if you ever come along the town of Azuchi in Shiga province, try the sweets based on the makezu no tsuba.